This in order to take benefit of using Group Managed Service Accounts (GMSA – generated and maintained by the Key Distribution Service (KDS) on at least Windows Server 2012 domain controllers). The same applies to Device Registration service (DRS) aka Workplace Join, which is responsible for activation and enrolment of controlled devices and represented by a new schema class in Active Directory Domain Services (AD DS). During a Windows Intune proof of concept (PoC) engagement we had to deal with an environment having native Windows Server 2008 R2 domain controllers available. As DRS was not a deliverable of this PoC we could bypass the AD FS prerequisite by using a default service account. “gMSA is not required to be the service account that AD FS runs on. It is an additional optimization that is available to customers if they have Windows Server 2012 domain controllers or above available”. So this paves the way for continuing the PoC using the traditional service account option during the installation of AD FS. 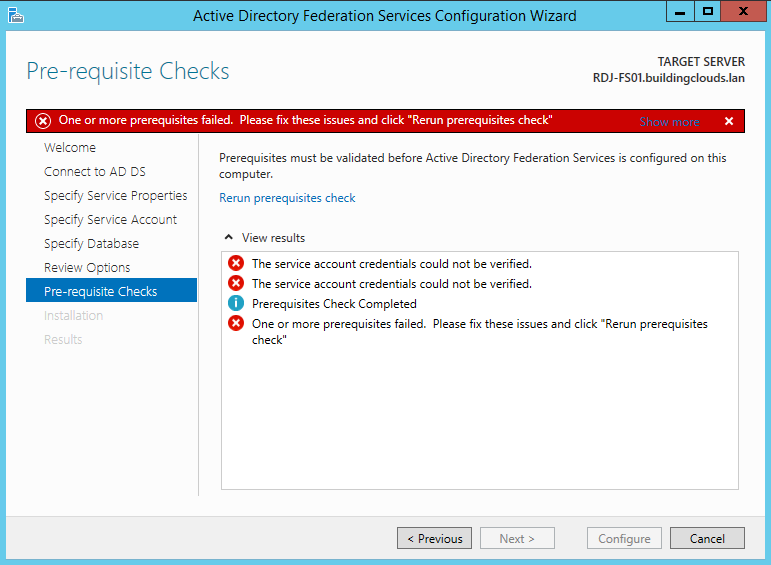 Make sure the service account you manually created is moved to the Managed Service Accounts container otherwise you will not pass the AD FS pre-requisite checks during the AD FS configuration wizard. 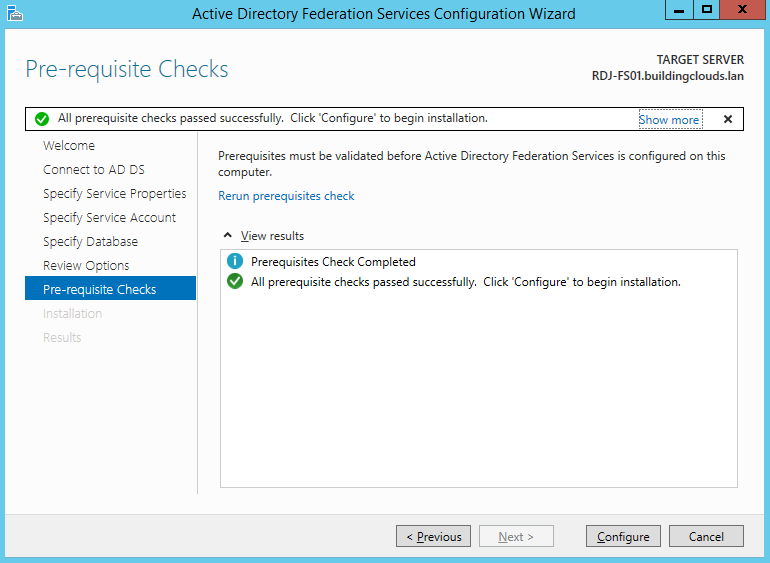 After moving the service account to the Managed Service Accounts container we passed the pre-requisite checks and configured AD FS successfully! The process of configuring manually a service account for AD FS is described here. For AD FS to be supported, domain controllers in all user domains and in the domain that AD FS servers are joined to must be running Windows Server 2008 or later. Does the service account absolutely have to be moved to the to Managed Service Accounts Container? I have a working ADFS 2.0 implementation and due to some funky GPO settings if I move the account to that container I suspect the ADFS 2.0 farm will come to a grinding halt. Just commenting to confirm Ian Clarkes assertion. I have a multi domain / multi site forest with a forest functional level of Windows Server 2003 and a domain functional level of Windows Server 2003. The forest contains 2003, 2008R2 and 2012R2 DCs and have deployed ADFS 3.0. Thanks Brian for confirming. Appreciated!